This book is authored by Mr. M S K Dharmawardhana, Additional Director of the Regional Development Department of the Central Bank. The book targets students, Micro, Small and Medium Scale Entrepreneurs (MSMEs) and Bankers who look for basics on Entrepreneurship Development. Book contains products and services available for MSMEs, activities carried out by the Regional Development Department of the Central Bank to support MSME sector in the county, the basics of Financial Management, Marketing, Accounting and legal requirement for entrepreneurs. The coverage and presentation of the book is reader-friendly and provide readers with a fair guide to study on entrepreneurship development in practical aspect. 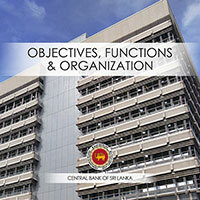 A booklet on the role and operations of the Central Bank. Available in English. A booklet to increase awareness about the financial system, institutions, products and investments. Available in Sinhala and English. Describes the Scripless Securities Settlement System and Central Depository System. Available in English on-line only. The publication describes the history of coins and currency in the island. Available only in printed form in English. Describes the main components of the LankaSettle System - the Real Time Gross Settlement (RTGS) System and the Lanka Secure System (Scripless Securities Settlement System and the Central Depository for Government Securities). Available in English on-line only. An introduction to the theories of international trade Available in Sinhala only. A booklet contains Directions and Rules issued to the finance companies. Available in English. A booklet contains Directions, Rules, Determinations, Notices, and Guidelines issued to Licensed finance companies. Available in English. This booklet contains Directions issued under the Finance Leasing Act, No. 56 of 2000. Available in English. Educational pamphlets in simple language to enhance public understanding on the role of the Central Bank and its activities. Available in English, Sinhala, and Tamil. Explains what is meant by price stability, how it is measured, why it is important and the factors that affect price stability. Inflation containment measures and how monetary policy is used to achieve and maintain price stability is also described. Available in English, Sinhala and Tamil. Explains what is meant by financial stability, the factors that contribute towards achieving it, the causes and consequences of financial system instability and the role of the Central Bank in maintaining financial system stability. Available in English, Sinhala and Tamil. Explains the factors that determine exchange rate depreciation and appreciation, the significance of nominal and real effective exchange rates and different exchange rate regimes. Also, provides and overview of the foreign exchange market and the role of the Central Bank in maintaining exchange rate stability. Available in English, Sinhala and Tamil. Describes the nature of different types of Pyramid Schemes, outlines the dangers they pose and provides tips on identifying Pyramid Schemes. Available in English, Sinhala and Tamil. Provides information on the various categories of institutions that are legally authorised to accept deposits from the public. Available in English, Sinhala and Tamil. Describes the offences of money laundering and terrorist financing, the methodologies adopted by money launderers, the negative consequences associated with money laundering and terrorist financing. The laws on money laundering and the duties and responsibilities imposed on persons and entities in terms of these laws, are also explained. Available in English, Sinhala and Tamil. Describes the "LankaSecure" system which consists of the Scripless Securities Settlement System and the Central Depository for Government Securities. Available in English, Sinhala and Tamil.